Playing as a young man, I run up verdant hills to a church. I’m told of this person’s disdain for local conflict-heavy politics and his love for his community. Then I step on a mine and die. No respawn. That was just the game’s opening. 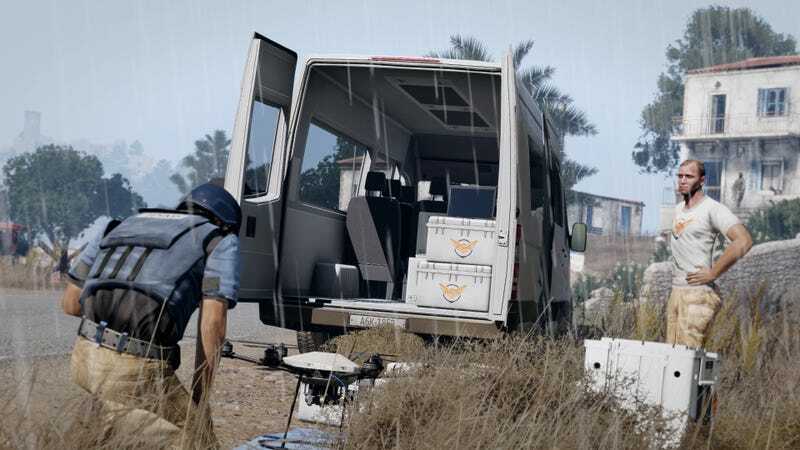 Laws of War, a mini-expansion for military sim Arma III that came out last week, has a campaign that’s brief but poignant. It centers around a new faction called the International Development & Aid Project, or IDAP, who focus on responding to humanitarian disasters. You play as Nathan McDade, whose weird last name rolls off the tongue like a bowling ball going down an upward escalator, but who provides a firsthand look at his organization’s relief efforts. Cleverly, Laws of War accomplishes this in two ways: most overtly, you control McDade as he and his staff dispose of still-active mines in the ruins of a near-future Oreokastro, Greece. While he does this, however, he’s being interviewed by a journalist, Katherine Bishop, giving him a reason to go over details of his day-to-day with a fine-tooth comb. Through this framing device, the player gets to learn about authentic laws of war, as well the excruciating civilian consequences of battle. Where possible, Laws of War makes it personal. The main story teaches you more about the young man you play as in the game’s opening, as well as his brother, who played an important role in the conflict that tore apart their home. This often manifests in the form of flashbacks that you can access by approaching shimmering pockets of the map which hurl you back to previous years in that area. Shorter flashbacks tend to have you wandering about as a slightly younger McDade, back before a major conflict forced IDAP to flee the area. They result in some striking scenes. For example, at one point I approached some fellow IDAP workers standing next to what appeared to be body bags. On the nose? Sure. But war isn’t generally known for its subtlety. Laws of War also includes lengthier flashbacks that function more like traditional Arma III levels, including a fair amount of combat. If you’re used to less realistic shooters, these levels are not exactly easy, but they lead to a powerful pay-off in that, slowly but surely, you get to see the tolls your own battles take. Those mines you’re cleaning up as McDade? Somebody had to plant them. People (some of whom you play as) die, and communities—full of bright and kind individuals whose stories you learn—fall to ruin. You’ll probably accidentally shoot some civilians, and if you’re like me, you won’t feel great about it. It’s not long before it becomes apparent that your efforts as McDade and co, while valuable, are often just clean-up. It’s crude and disheartening work, but somebody’s gotta do it.